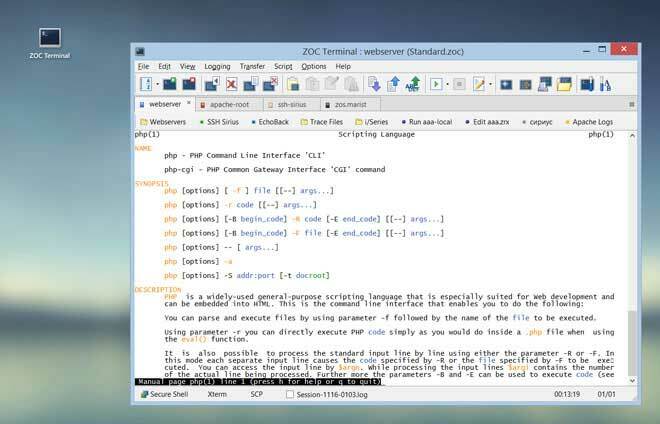 ZOC Terminal is a professional secure shell client and terminal emulation. Through its modern user interface, it will make your life easier in many ways. ZOC Terminal is a professional and feature-rich ssh client for Windows and macOS. It lets you access servers and network gear using the secure shell protocol. The program offers everything that you expect from a modern secure shell client. SSH (Secure Shell) is a cryptographic network protocol that transports data securely over an unsecured network. As the name implies, its main purpose is to provide a secure connection to a remote shell account. The SSH client is the software, which the user runs on his local computer to connect to the remote computer. Once connected, the ssh-client enables the user to run programs or perform other tasks on the remote server.